KNOW God or NO God? You have either one or the other! If You Don’t KNOW God, Then You Have NO God! We may practice a faith tradition that follows Jesus. But if we don’t KNOW God, we truly have NO god! KNOW God? Or NO God! I was raised in a faith tradition where adherence to an external religious code of conduct was considered necessary in order to maintain a close walk with God. Well into my adult years, I believed that this was what God wanted us to do. Although I went to church every Sunday, I realize now that I really didn’t know God at all. The first time I heard a real Bible sermon (I was in my 40’s) I was absolutely astonished! I had no idea that the Bible possessed such practical wisdom for all situations of everyday life. I’m sharing these things about myself in order to encourage others who may have grown up in biblical illiteracy as I did. It’s important because this is about all of us getting to know God. You may know some things ABOUT God, but that is not the same as getting to know God. You or I could go the bookstore or to the library and get books about the president of the United States. But even if we were to memorize those books, all we would have would be head knowledge. We would have information about the president — but we wouldn’t have a relationship with him. We wouldn’t know him. Premise: Every person needs to know God! Purpose: Why is it that I’m urging everyone to know God? Participation: Who is this command intended for? Problem: How do we get to know God? Payoff: What will be God’s response to me? Peril: What of those who choose not to know God? Each one of us needs to pursue and maintain a relationship with our Creator. But because we have a free will, God will not force Himself upon us. It’s up to each one of us to make the first move. Purpose: Why am I saying that every person needs to know God? I’m saying we need to Know God because God Himself has said it. To see the passage in it’s context in Hebrews 8, Click Here. Can you see the many helpful thoughts in this passage? Paul prayed that they would know God’s will for their lives. Strengthened with power from God, for patience and longsuffering — WITH JOY! If God had a Facebook account He would be inviting you to “Friend” Him! To put it in a more conventional way, God wants you to get to Know Him. He already knows way more about you than you know of yourself, but He wants it to be a two-way relationship. <="" strong=""> How do we get to know God? We know each other by what we say. We know each other by what we do. We know God in exactly the same way: by what He says and by what He does. Both relationships — human-to-human and human-to-God — require spending time together. Therefore the more we know the Bible, the more we know God! Q: How do we get to #KnowGod? A: We know God The same way we know each other: by what He says and by what He does. In verse 6 above, the phrase “on your heart” refers to something that you have memorized and that you consider to be a life-principle that you live by. This is the origin of such common expressions as “to know it by heart” or “taking it to heart”. Would someone please tell me this: how is it possible to “walk in all his ways” and to “keep the commandments and statutes of the Lord” without knowing His ways and without knowing His commandments and His statutes (or His teachings, ordinances, precepts, testimonies, judgments, laws, and commands)? We’re willing to learn the right ways of doing things in many other areas of our lives. We go to great lengths to know and abide by the laws and statutes of our cities, states, and nations that we live in, do we not? For a moment, just imagine if that were not so. Imagine the chaos if most people behind the wheel of a car did not know the traffic laws; had never taken lessons, but instead were making up their own driving rules according to what seemed right to them! What if you discovered that your “doctor” was really an impostor who had never gone to medical school? Would you trust your accounting needs or your income tax preparation to someone who struggles with basic arithmetic? As you board an airliner, are you not assuming that the Captain and and First Officer are alert, fully trained, well rested, and with logbooks showing tens of thousands of hours of flight experience? We could go even farther with the last example and profess confidence that the people who built the aircraft, and those who maintain it, are doing their jobs according to a strict body of knowledge that they went to great lengths to learn. We could go still farther and be confident that the engineers who designed the airplane you are flying in knew the truth of their profession and applied it properly. And we could go farther yet acknowledge that the the university professors who taught the engineers did an excellent job of explaining, motivating, and in general transferring their hard-won knowledge to their students. Ultimately, we need to have confidence in the God who created every atom in the universe from nothing, and who maintains the properties of the materials the airplane is made of moment-by-moment, even allowing the parts to “wear out” precisely as He ordains. Do we not indeed serve an amazing God? Did you know this? God is holding together the very atoms of your body RIGHT NOW! He is doing so much for us, and all He asks is that we acknowledge Him and spend a little of our time getting to know God. But sadly, the majority of the people God created choose to go through life spiritually blind either for lack of knowledge of what God asks of us or because they refuse to undertake the discipline of getting to know God by investing time in learning His Word. Payoff: How will God respond to those who choose to draw near to Him? “For this is the covenant that I will make” (v 10a) They will be in a covenant relationship with God. “I will put my laws into their minds, and write them on their hearts” (v 10) They will have some of His Word into their minds and hearts. “and they shall be my people” (v 10) God will know them as “His People”. “for they shall all know me” (v 11) THIS IS WHAT GOD LONGS FOR! When you know God’s Word, you know God. The more of His word you know, the more you know God. It’s that simple! “I will remember their sins no more.” (v 12b) In His infinite mercy God has devised a way to make His people as though then never committed a single sin! According to passages such as Ephesians 2:11-22 and Romans 11:11-24 we who are not Jews by genealogy have been grafted into the covenant described in the passage above. We also can know God. When He says in verse 10, “I will put my laws into their minds, and write them on their hearts” I’m certain it doesn’t imply that God intended to do that instantly. Aside from inspiring the writers of Scripture, there is no record that I’m aware of where God just “instantly downloaded” Bible passages into a person’s mind automatically. So I ask you again: How can anyone “keep His commandments” without investing time in internalizing some of His teachings, statutes, ordinances, precepts, testimonies, judgments, laws, and commands? I just don’t believe it’s possible. You cannot know God without knowing His Word. Peril: What about people who choose to be indifferent to God? Because every person has a free will, God will respect any person’s right to keep Him out of their lives. They can choose not to know God. But as the old saying goes, “You can’t have your cake and eat it!” The separation from God that people demand now will extend beyond this life and into eternity. OOPS!! In the faith tradition I used to be in, I actually heard people ask (regarding church attendance), “How late can I be and have it still count?” or “How early can I leave and have it still count?”. The first time I saw that verse, it was like seeing myself in a mirror! That verse was describing me and the attitude I had toward God. I resolved never to be like that again. I stopped ignoring God; stopped simply giving Him lip service, and made Him the number-one priority in my life. If I could do that, anyone can do that. God longs for a two-way relationship based on love. What He doesn’t want are people who don’t seem to want to know God, but instead are focused on “reverence-by-rote”, adhering to an external man-made religious code. Those are the people for whom “the gate is wide and the way is easy” (Matthew 7:13-14); for whom “the word of the cross is folly [foolishness]” (1 Corinthians 1:18); of whom Paul wrote, “if our gospel is veiled, it is veiled to those who are perishing” (2 Corinthians 4:3-4). Here’s another example. In the parable of the sower three out of the four groups didn’t “get it”. They were totally plugged into the “world system”. They don’t know God. The only group that really “gets it” are those who, “hearing the Word, hold it fast in an honest and good heart, and bear fruit with patience”. In a comparison between a house built on the rock and another built on sand, Jesus once again describes two groups. Jesus doesn’t actually say that those in the second group are going to hell, but do you really want to test that? How close to the edge of the Grand Canyon can you tap dance? Speaking personally, I could not call Jesus my SAVIOR if I were unwilling to submit to His authority as LORD over my whole life! Don’t be a GOLD-DIGGER Christian! In the usual context, the term “gold-digger” refers to someone who marries for profit instead of for love. They mainly want access to their spouse’s money. In the context presented here, Pastor Colin Smith suggests that many who call themselves Christians are only interested in what Jesus can do for them. Getting to “know God” is not part of their plan. Her “beloved” is none other than King Solomon. Pastor Colin describes their love for each other as an allegorical description of the love God has for His “bride”, which is the Church. That’s us. As true believers, we are all part of this story of love. Listen now as Pastor Colin describes how so many have responded to God’s longing for a love relationship with each of us. If you ask me, many churches are doing a terrible job of teaching this to their congregations. Here are a few quotes from this podcast sermon. “But here’s my question: is that not precisely the way in which we may have too often regarded Jesus Christ? He owns Heaven. He can get us out of Hell. He can get the blessings of God that will make life better for us, and so we’re going to ‘accept Him’. In which you make a decision in order to get out of hell, get into heaven, accept Jesus, get God on your side. Your life will be better that way but very little LOVE for Jesus Christ. There is nothing very surprising about a Christian who loves Christ when everything is going well. But Christians who love the Lord when good gifts are taken away or are withheld: they demonstrate in heaven, on earth, and in hell, that they really do love God, and not just His gifts. That is, or course, the main point in the book of Job. In my article entitled The Meaning Of Life Is What? I wrote about how life is a sorting process. The Bible sorts people into two groups. The small group is going to Heaven; the other is not. Did you live according to the values of the world around you? I challenge you this day! Do what most people do not do: Get to KNOW GOD! And then: find a way to help others to know God. They will have NO GOD. They will remain separated from God for all of eternity! Here’s something you’ll really enjoy listening to! 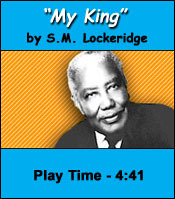 Listen as Bible preacher S.M Lockeridge describes the King of Kings. Here’s a man of who truly does know God. The title of his message is “My King”, and it’s less that 5 minutes long. I hope you are taking this seriously! The devil is hoping you won’t. Right now he’s putting all kinds of reasons into your mind as to why you shouldn’t do anything like equipping yourself to stand against him. But I’ve made it easier for you. Here are links to all the information and encouragement you need, right here! PUT THE DEVIL IN HIS PLACE: I’ve got a whole series of articles dealing with Spiritual Warfare for you to help strengthen you for combat. You’re in a war, you know! GET INTO GOD’S WORD SO HE CAN GET HIS WORD INTO YOU: I also have a series on getting God’s Word into your mind and heart. Yes, this is Scripture Memory. I know you don’t like that topic, but it’s medicine for your soul. Open wide now, and take your medicine! God bless you Jan. I like this article is very good, I will probably read it again. Hi Jan! Absolutely great article. I really appreciate how you break things down, making it very clear and concise. This really made me think! I want to get to know God more. It’s easy to oversee that a lot of us may just be going through the motions and not truly enjoying a 2-way relationship with Him! The little sermon was very good as well. “Gold digger Christianity”. Yikes! I am sad to admit I think I’ve been this Christian before. Thanks again for you article! Excellent article Jan! It really is very important to get to know God through His word and then living and acting according to what He desires us to do, namely loving others as He loves us and keeping His commandments. Also so very true about gold-digger Christianity. It’s very easy with all the distractions of this world to simply accept Jesus and then only stick around for what He can offer. But so much more important it truly is to surrender our all and allow Him to equip us for His use. I love this article so far! I haven’t finished because its 1:39 am but what I have read so far is inspiring! Ariyail, thanks for writing! I’m glad you like it so far. Let me know your opinion when you’ve read the whole article.